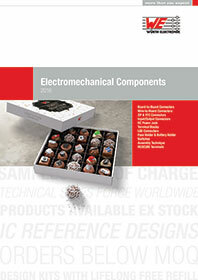 The latest catalogue of Würth Elektronik’s electromechanical component range runs to 1098 pages. The new edition of the directory, available in English, lists information on 12 standard product groups, including many innovations. All components featured in the catalogue can be ordered from stock anytime and no minimum order quantity is needed.